"The People's Car" - Tata Nano is Real! Submitted by peter on 10 January, 2008 - 22:18. How about this for an amazing feat of stingy design and cost cutting measures? Tata seem to have done it, and after 4 years of head scratching the Indian giant has come up with a car that costs around US$2,500. That is less than THB 75,000!! The Nano is designed to allow Indian families to move up to four wheels, and whatever you might say about the safety or comfort levels of the Nano, when considered next to a motorbike, this thing is a big improvement. For a start it probably won't go very fast with its tiny 623 cc two cylinder engine. 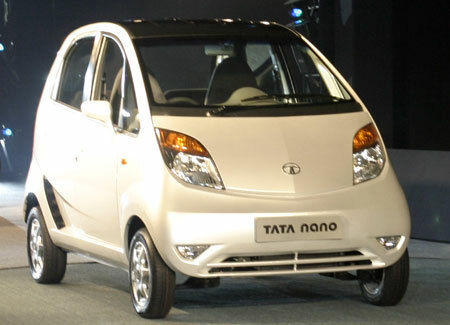 Tata Motors are billing the Nano as a "People's Car"....... now where have we heard that one before? Could this be an Eco Car contender? Time for some more Eco Car speculation! If you are not interested in the Eco Car project, but would like to know more about the Nano, just skip down to the press release below. Tata Motors is one of those car makers that filed an application for the Thai Eco Car project, and the Nano would seem idea. Meeting the Euro 4 emissions standard and being small enough to qualify for the project, there is nothing to disqualify the Nano from what I've seen. If the Nano could be produced in Thailand anywhere close to the Indian price point then this could possibly be on the market in Thailand, with air-conditioning for under THB 100,000!!! Considering that other Eco Cars will likely cost 3 times as much, the Tata Nano could sell in very large numbers. Mr. Ratan N. Tata, Chairman of the Tata Group and Tata Motors, today unveiled the Tata ‘NANO’, the People’s Car from Tata Motors that India and the world have been looking forward to. A development, which signifies a first for the global automobile industry, the People’s Car brings the comfort and safety of a car within the reach of thousands of families. The People’s Car will be launched in India later in 2008. The People’s Car, designed with a family in mind, has a roomy passenger compartment with generous leg space and head room. It can comfortably seat four persons. Four doors with high seating position make ingress and egress easy. Yet with a length of 3.1 metres, width of 1.5 metres and height of 1.6 metres, with adequate ground clearance, it can effortlessly manoeuvre on busy roads in cities as well as in rural areas. Its mono-volume design, with wheels at the corners and the powertrain at the rear, enables it to uniquely combine both space and manoeuvrability, which will set a new benchmark among small cars. When launched, the car will be available in both standard and deluxe versions. Both versions will offer a wide range of body colours, and other accessories so that the car can be customised to an individual’s preferences. The People’s Car has a rear-wheel drive, all-aluminium, two-cylinder, 623 cc, 33 PS, multi point fuel injection petrol engine. This is the first time that a two-cylinder gasoline engine is being used in a car with single balancer shaft. The lean design strategy has helped minimise weight, which helps maximise performance per unit of energy consumed and delivers high fuel efficiency. Performance is controlled by a specially designed electronic engine management system. The People’s Car’s safety performance exceeds current regulatory requirements. With an all sheet-metal body, it has a strong passenger compartment, with safety features such as crumple zones, intrusion-resistant doors, seat belts, strong seats and anchorages, and the rear tailgate glass bonded to the body. Tubeless tyres further enhance safety. The People’s Car’s tailpipe emission performance exceeds regulatory requirements. In terms of overall pollutants, it has a lower pollution level than two-wheelers being manufactured in India today. The high fuel efficiency also ensures that the car has low carbon dioxide emissions, thereby providing the twin benefits of an affordable transportation solution with a low carbon footprint. Tata Motors is India's largest automobile company, with revenues of US $ 7.2 billion in 2006-2007. With over 4 million Tata vehicles plying in India, it is the leader in commercial vehicles and the second largest in passenger vehicles. It is also the world's fifth largest medium and heavy truck manufacturer and the second largest heavy bus manufacturer. Tata cars, buses and trucks are being marketed in several countries in Europe, Africa, the Middle East, South Asia, South East Asia and South America. Tata Motors and Fiat Auto have formed an industrial joint venture in India to manufacture passenger cars, engines and transmissions for the Indian and overseas markets; Tata Motors also has an agreement with Fiat Auto to build a pick-up vehicle at Córdoba, Argentina. The company already distributes Fiat branded cars in India. Tata Motors’ international footprint includes Tata Daewoo Commercial Vehicle Co. Ltd. in South Korea; Hispano Carrocera, a bus and coach manufacturer of Spain in which the company has a 21% stake; a joint venture with Marcopolo, the Brazil-based body-builder of buses and coaches; and a joint venture with Thonburi Automotive Assembly Plant Company of Thailand to manufacture and market pick-up vehicles in Thailand. Tata Motors has research centres in India, the U.K., and in its subsidiary and associate companies in South Korea and Spain.